I’d argue that if you don’t know how to be more confident with woman than the average guy, then it’s likely you won’t get further than the average guy when you’re trying to approach her. Women immediately feel it when you have confidence, even if they don’t show it. Everyone will feel it, even the guys that are nearby. Confidence is something that glows around you when you have it, and something that’s very obvious when you don’t. So if you’re searching for quick ways to build confidence with women, then here are some rock solid tips. Realize that building confidence takes a lot of time and practice. It’s not something that magically happens overnight, it’s something that takes anywhere from a few weeks to a few years to develop. If you’re looking to do it the fast way, and who isn’t, then the best way is to start by making friends with some girls. Wait.. isn’t that what I’m having issues with? No, you should be having issues with attractive girls. Find girls that you really aren’t interested in having an intimate relationship with, and befriend them! The mere act of being surrounded by females on a frequent basis will help you tremendously in being more comfortable around women. Having female friends is the number one way of being more comfortable with women. Just don’t fall in love with your female friends … although if you do, is that really such a bad thing? The next solid piece of advice is to go to the gym. That’s because how you feel physically is linked to how your mind feels about you in general. If you feel good after working out, and you always do, then your mind will feel good about you in general. It’s really not about the muscles or the health, it’s simply about feeling accomplished, energized and vibrant. Working out at the gym does this better than anything else in the world. In addition, the more you go to the gym, the more people will notice your appearance improve and therefore you’ll be getting compliments on more frequently. Imagine how you would feel if you were on the receiving end of compliments every day? If girls came up to you and said you looked good… wouldn’t that boost up your confidence pretty quickly? Yeah, I thought so. 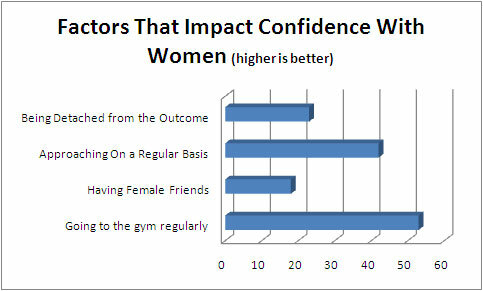 #1 Go to the gym if you have a confidence issue. The next way to be more confident with women is to be completely detached from the outcome. The greatest gift you can give yourself is to simply stop caring about what other people think. I know it can be hard. The trick is to concentrate on meeting people instead of trying to ‘win’ every interaction you have. If you’re just out to meet people instead of pursuing a specific objective, you’ll feel much more comfortable with yourself. You can’t be timid if you aren’t afraid of losing, and you can’t lose if you aren’t actively trying. Now I’m not saying don’t try to pick up women, I’m just saying that you shouldn’t feel as if you lost if an interaction doesn’t go as planned. If you meet a woman and have a great time, then that’s fantastic. If you meet a girl and things don’t go as smoothly, then that’s fine as well. You shouldn’t worry about what a girl says, or what hundreds of girls say for that matter. That’s because they don’t truly know you, if they did, then they’d understand where you’re coming from. At the end of the day, confidence doesn’t come easy. If I painted the picture that you can simply go to the gym and be confident, then I’d like to apologize because although that’s a great method, it won’t do it alone. Confidence is something you have to work on every single day. You will have to be rejected many times over to toughen you up, you’ll have to accomplish many feats that you never thought possible and eventually, you’ll be showered with compliments you never expected. Hard work will solve any confidence issues, so get to it today. From my experience, if you follow this advice on how to be more confident with women, then within a few weeks you’ll start noticing massive differences. This includes going to the gym, getting female friends and actively approaching women. If you don’t, then you can be as good looking as you want and you still won’t get any women. If there’s one area where i lack, this is it. Hang out with people that are worse looking than you, then you’ll automatically feel good looking! Don’t do that, if you hang out with people that are worse looking than you, it lowers your social value. Hang out with good looking people and then you’ll be used to being surrounded by beautiful people. GUYS, it’s not all about looks. Confidence is about knowing that you’re good. It’s about accomplishments, go out and do something you’re proud of. Then you’ll feel confident. Hellomon: you’ll get it figured out “eventually”? Forget that! If you want to change. Then Change! !